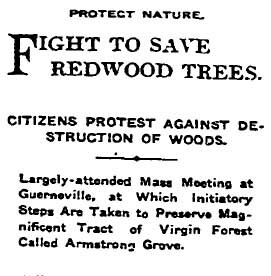 Elected officials addressed a large rally devoted to saving the 800-acre Armstrong Grove, named after lumber baron J.B. Armstrong, who decided to save the stand of soaring redwoods rather than clearing it. “Armstrong Grove contains the finest and largest redwood timber in California,” The Times said. “For years it has been a great attraction to tourists and is one of the features of the Russian River section. Although Armstrong’s will donated the land to the state of California, the Legislature rejected the bequest over some of the will’s stipulations. Sonoma County bought the land from Armstrong’s daughter in 1916, and it wasn’t until 1934 that the state of California took over the park. To further protect the redwoods, the area was designated as a reserve in 1964.